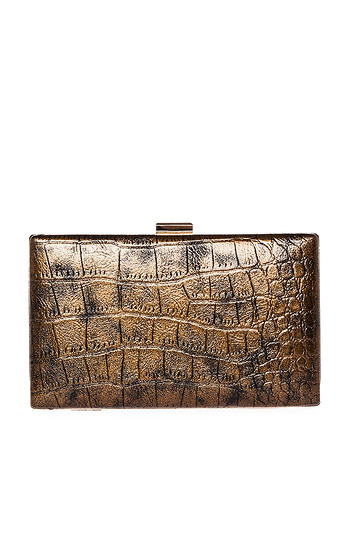 Box clutch featuring alligator embossed metallic faux leather and a detachable chain link shoulder stap. I've only used this clutch once. The walls of the clutch are not securely fastened to the frame and I guess I stuffed it too full bc one side of the clutch wall looked like it was going to completely unfasten from the frame if that makes sense. There was a gap between the frame and the wall. When I got home and emptied the clutch, it went back to its normal state. I really hope it doesn't fall apart on me. I also wish there was a way to adjust the length of the straps, as it feels too long on my 5' 2" frame. Well crafted, and the colour is spot on; it receives a lot of compliments whenever I trade out my purse for the night. My only gripe (and it's a very minor one) is the chain strap. It tends to be very bothersome, always getting in the way so I've found it best to remove it entirely. Besides that, there isn't any other qualms that comes to mind. It's roomy enough to accommodate my mobile and wallet (which isn't your standard, run of the mill wallet but, rather, a slim cigarette case I use instead), and maybe some loose change but probably nothing else, making it best used as an 'on occasion' clutch opposed to an everyday one.